unlimited control of the speakers that are connected. The bandwidth is also extreme and goes to 400.000Hz, resulting in improved slew-rate. 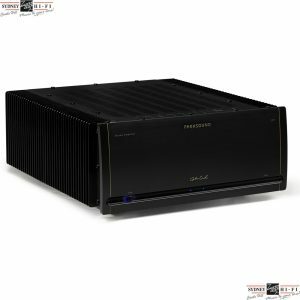 This amplifier has – like any Densen amplifier – the capability to drive any loudspeaker on the market. The sound is fast, transparent and dynamic while still having the refinement of a true musical performer. The B-320PLUS is built using surface mounting techniques and the components are mounted to a precision of 0.02mm using silver solder. All solderings are made in an artificial nitrogen athmosphere to avoid oxidation of the solderings. The power supply is massive and consists of a 800VA transformer, with a storage capacity of 100.000uF with 4 separate rectifiers, of which the 2 are capable of 3.000VA. Unusually for an amplifier, the capacitors are not all mounted in a capacitor bank; some are located next to the output stage for faster power delivery. All resistors are laser-trimmed Vishay metalfilm with a precision of 0.1%. As a special feature, the emitter resistors consist of twelve 0.1% metalfilm resistors in parallel (per output transistor = 96 resistors in total), ensuring no induction and, at the same time, a large surface for passing the substantial audio signals to the output terminals. Since they are in parallel, they actually have a much improved sonic signature compared to the conventional solution with a single resistor. The B-320PLUS delivers 2x100W at 8 ohm, and 2x200W in 4 ohm. The mains transformer is wound in a special way to lower the noise floor and actively function as a shielding transformer. 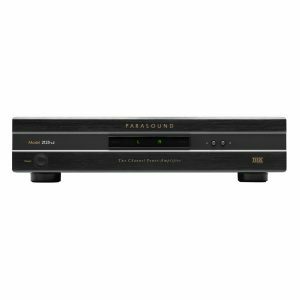 By using a new power supply set-up, the B-320PLUS also has an extremely “dark” background, which makes the amplifier sound extremely controlled, but still provides lots of emotion and spark. No local or global feedback is one of the key issues with all Densen designs, including the B-320PLUS. This technology is now further improved with Densens new patent pending DMCD circuit. DMCD stands for Dense Mass Current Distribution, and by using the DMCD circuit, the current is at all times present at the output terminal. 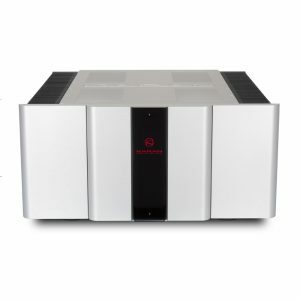 This results in an extremely low output impedance and a truely non-feedback amplifier. The circuitry is manufactured as single ended all the way from the input terminal to the output stage. The Printed circuit board is made of teflon and is doublesided, allowing the signal to be placed on one side and the groundplane on the other, thereby optimising interference free signal transfer. The B-320PLUS contains several exciting features. 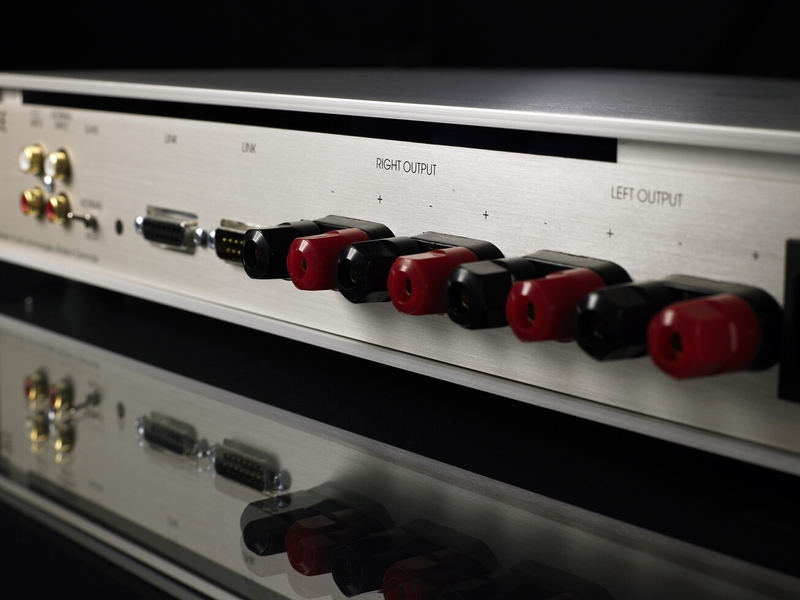 On the backpanel there is an external switch to adjust the gain, so that the B-320 works perfectly with a traditional preamp, as well as with a CD-player with variable output. 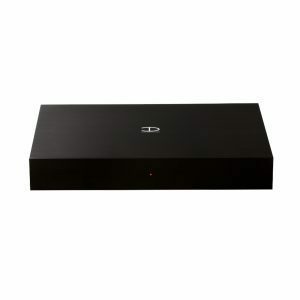 There is also a D-Sub15 connector, allowing for DenLink connection to other Densen products, such as auto power on/off from a Densen preamp or integrated amp. The output terminals are doubled for easy bi-wiring. The B-320PLUS is also prepared for Densen’s SAXO electronic crossover, so that the B-320 can be used in active systems. This is done by mounting the crossover in an internal socket. The SAXO crossover is user adjustable and will fit all speakers on the market.